All year excl. 6 November - 15 December. 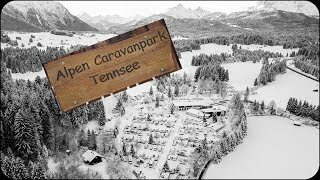 Tennsee is an excellent, friendly site in truly beautiful surroundings high up (1,000 m) in the Karwendel Alps with super mountain views, and close to many famous places of which Innsbruck (44 km) and Oberammergau (26 km) are two. Mountain walks are plentiful with several lifts close by. It is an attractive site with good facilities including 164 serviced pitches with individual connections for electricity (up to 16A and two connections), gas, TV, radio, telephone, water and waste water. The other 80 pitches all have electricity and some of these are available for overnight guests at a reduced rate. Reception and comfortable restaurants, a bar, cellar youth room and a well stocked shop are all housed in attractive buildings. Many activities and excursions are organised to local attractions by the Zick family, who run the site in a very friendly, helpful and efficient manner. The first class toilet block has underfloor heating, washbasins in cabins and private units with WC, shower, basin and bidet for rent. Unit for disabled guests with the latest facilities. Baby bath, dog bathroom and a heated room for ski equipment (with lockers). Washing machines, free dryers and irons. Gas supplies. Motorhome services. Cooking facilities. Shop. Restaurants (waiter, self-service and takeaway). Bar. Youth room. Solarium. Bicycle hire. Playground. WiFi (charged). Organised activities and excursions. Bus service to ski slopes in winter. 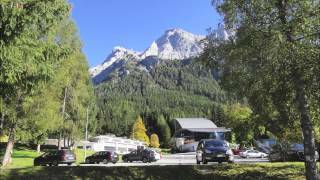 Site is just off main Garmisch-Partenkirchen-Innsbruck road no. 2 between Klais and Krün, 15 km. 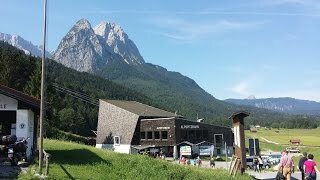 from Garmisch watch for small sign Tennsee & Barmsee and turn right there for site.